And the race for the “best girl” continues as Raku tries to find the key to his heart, literally (or it seems not), in the second season on Nisekoi. If you were a fan of Nisekoi I’m assuming you have already watched the first 20 episodes prior to watching the second season, otherwise this review wouldn’t make much sense. I’ll attempt to keep this review short since the sequel came, from what I understood from the fans online, “short” to most people’s expectations. Not sure how I feel about the sequel to the fan favourite first season of Nisekoi, but the second season seemed a bit lacklustre to me. Leaving off from the first season I anticipated that the second season would follow the plot from the first season and that’s finding out whether, Chitoge, Onodera or Marika had the proper key to unlock that infamous necklace of Raku’s from “10 years ago.” Sadly enough the second season only skinned a bit of this and we were left with no plot to follow *sad face. Now since the second season didn’t follow the original plot, it took a different route and followed an episodic format of telling stories. A few of these episodes allowed us to get in touch with some our favorite characters, like Chitoge, on a deeper level by introducing her mother and their backstory. And the rest of the episodes were mindless, pure comedy- not that it was a bad thing, there were some great/hilarious moments, but it got a bit redundant and by the end of it I just wanted closure on who had the correct damn key to that freaking damn locket! The characters themselves remain somewhat constant into the second season. Though we get to know Chitoge and Shu a bit more in a couple of the episodes but other than that, not much as changed. And of course there’s the new girl, Haru Onodera – Kosaki’s younger sister. Haru is basically fodder in Nisekoi, honestly think she has no purpose in the anime since she has NO interest in Raku and plays nothing in part to the actual plot and was a bit annoying to watch her tsundere tendencies around Raku. That’s about it when it came to the characters. Animation also remains constant from season one to season two. Not much to comment at all other than it’s well animated. I have to say though… initially I thought Raku’s character design was a chick, but he turns out to be a guy – didn’t like his design at first but it grew on me. Music and remains the same as well, not exactly sure if they used new tracks but the OST was reminiscent of the first set of tracks. Obviously the OST won’t go down in history as one of the best but it was very cute and warmhearted. The OP was not the best choice in my opinion. But the ED (Aimai Hertz (曖昧ヘルツ)) was one of my favourite endings this spring. Randomly bumped into a few piano covers of the ED on YouTube and I somewhat got hooked onto them. If you’re a piano player, like me, I contacted one of these anime/piano youtubers and he gladly wrote out the sheet music to the ending. You can download save the sheet music here: http://bit.ly/1efxHsx, and checkout his cover of the ending here: http://bit.ly/1SZp44T. 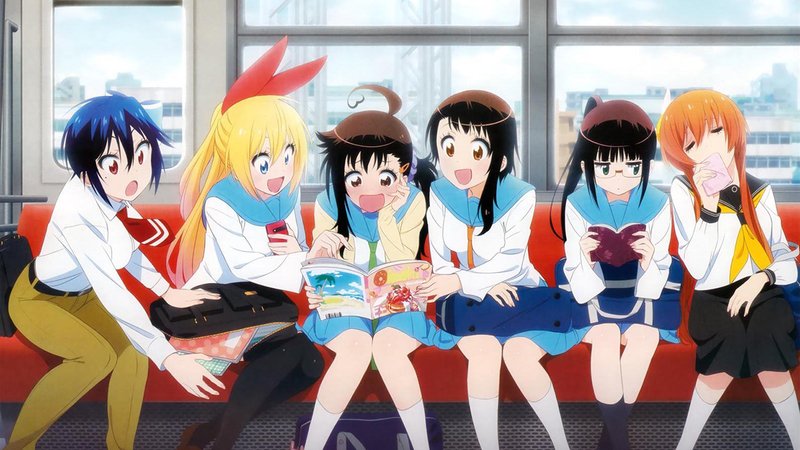 Overall the Nisekoi sequel was not as great as I expected to be compared to the first season. However it doesn’t mean that the episodes weren’t great, the last episode kind of saved the season. I expected that somewhere within the 12 episodes that someone would try to open that locket, but sadly no. If this anime gets picked up for a third season, I would hope that it would be the last season since I just want closure! And it better be Chitoge who has the right key. Sorry Onodera fans and Marika groupies, I’m #teamChitoge. Anyways that's it, thanks for reading, and I feel like this is my shortest review! If you finished reading it tell me your thoughts of the second season and what you thought of my review in the comments below!